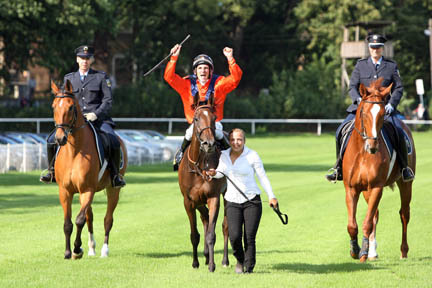 Racing NEWS from Berlin-Hoppegarten – Season 2012 our best meeting will be on Sunday, July 22nd with the Group 1 “122nd Grosser Preis von Berlin” over 2400m (one mile and a half) with prize money of €175,000. On the same day we will run Germany’s richest handicap worth €80,000 over 1800m (nine furlongs). This handicap is now a Listed Race aimed at horses with a minimum rating of 98 (3 yrs old) and 90 (4 yrs old +). Without doubt the highlight of 2011 was the return of the Group 1 Grosser Preis von Berlin to Hoppegarten for the first time since 1944. We were privileged to see DANEDREAM win her first Group 1 with the same ease as her subsequent wins in the Baden-Baden Grand Prix and the Quatar Prix de l’Arc de Triomphe. With a strong field of ten including two German champions and good international guests the Berlin Grand Prix became the top rated race of the entire German season.